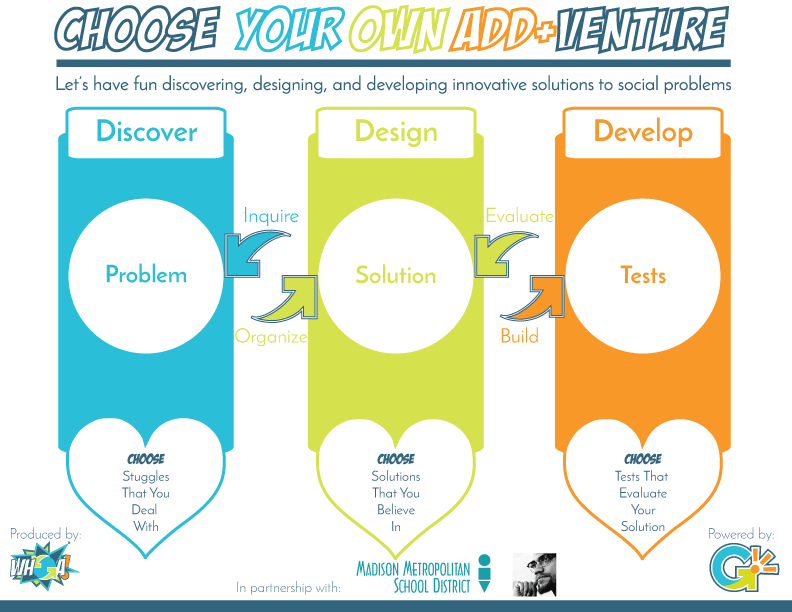 Choose Your Own Add+Venture is back in action, Summer 2019! If you’re going to be in high school in 2019-2020 school year and want to go join a team of future leaders that are driven to make our community better, apply now! MMSD high school students that join the Choose Your Own Add+Venture program will create a Venture, or new business, through a 4-D community and social innovation adventure! Discover, Design, Develop, and Deliver. The 6-week, 90-hour curriculum teaches students how to Discover local community needs, Design innovative solutions, and Develop testable prototypes that fulfill the discovered need. Upon successful completion, students earn two quarters of experiential school credit and a Youth Leadership Certificate (YLC). Course materials will be organized in Google Classroom, provided by the MMSD Experiential Learning Coordinator. The YLC portion of CYOAV culminates in a pitch competition, where each student team presents the Design that they Develop according to the community needs they Discover. A panel of entrepreneurs and local community members engaged by the students will judge their pitches and select the best solution. The winning team advances to the final CYOAV phase and will be paid $10/hr to operationalize their business model and Deliver their solution to the community, and further qualifies to earn a Youth Employability Certificate (YEC) in addition to the YLC. Students lead their way through CYOA+V with the aid of trained WHOA! facilitators. elevate wellbeing of themselves and their community throughout the process. WHOA! partnered with Shabazz City High School in Madison, WI in the 2016-2017 school year to offer the Choose Your Own Add+Venture program for credit. 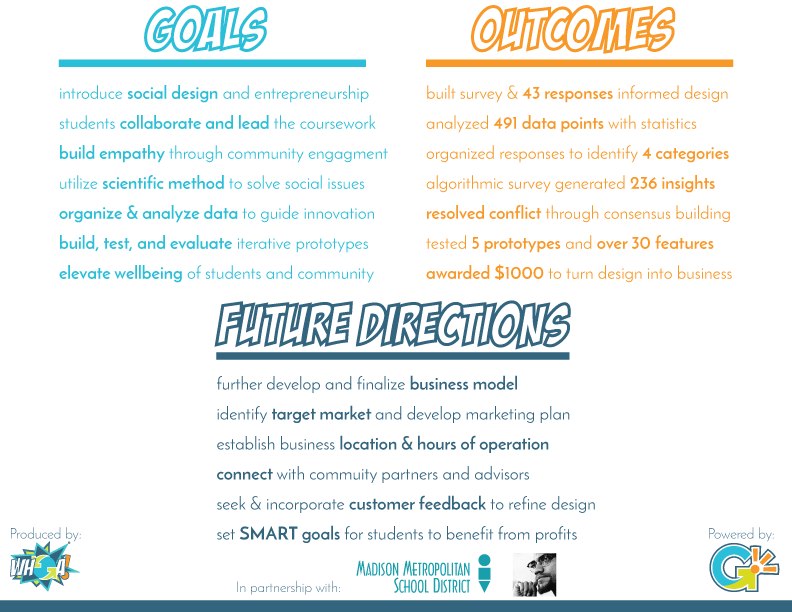 The goals, outcomes, and future directions of the work with those students is outlined below.